Doctor Who: Companion Pieces - ROMANA (I) | Warped Factor - Words in the Key of Geek. The key to success in Doctor Who has always been the slamming into gear of differences. Every time the Doctor regenerates, job one for the new incumbent is to be as different from their immediate predecessor as possible. The same is true of companions for the most part – the slamming change of gears from cool academic Liz Shaw to sweet, loyal scatterbrain Jo Grant, and from her to professional nosey parker Sarah-Jane Smith invigorated the show through the 70s. Likewise the change from the professional, slightly older Sarah-Jane to the stroppy teenaged savage Leela was a whole new direction. So when Leela left – where could the Production Team go next? The original answer – to bring back Sarah-Jane – was scuppered when Elisabeth Sladen declined the opportunity to return. The Production Team had to think again, and their solution turned out to be one of the most innovative – and risky – direction-changes in the history of the show. For the first time since Susan left, there would be a Time Lady on board the Tardis. What was more, she would be aloof, knowledgeable, a Time Lord swot who thought she knew it all and who would challenge the Doctor’s dilettante existence. She would be there for purposeful travel, not aimless wanderings, and she would stand for very little in the way of the Fourth Doctor’s trademark nonsense. The Lady Romanadvoratrelundar – Romana (or Fred) for short - stepped on board at the beginning of Season 16 for what was to be the show’s first real attempt at a season-arc – the Key to Time sequence. Six connected stories would see the Doctor and Romana hunt down the segments of the Key to Time in an attempt to restore universal balance. The First Romana was envisaged as an ‘ice queen,’ and if you were looking for an actress to play to that description, you couldn’t – and indeed, the Production Team didn’t – do better than casting Mary Tamm. Tall and with an aristocratic bearing, Tamm looked the part from day one – if anyone would curb the Doctor’s vagabond wanderings, it would be this Romana. But that wasn’t particularly the story the Production Team intended to tell. Rather, it was the broadening of Romana’s book-learning with the real-universe experience only travel could bring. Through being involved, she would learn that there was more to the universe than the Gallifreyan doctrine of strict non-intervention. Whether the scripts of the Key to Time season made the best use of Tamm’s gifts is a question that raises dubious eyebrows. There’s a certain inconsequentiality to the stories of the season and a sense in some cases that the writers didn’t know quite what to do with the idea of Romana as envisaged by the Production Team. The Ribos Operation is a rare instance of Robert Holmes mediocrity, with Romana called on to aid and abet the Doctor’s theft from Ribos’s treasure-room, and deal with the massively tedious interplanetary aspirations of the Graff Vynda-K. The Pirate Planet, which shouldn’t really ever rise above the level of farce, manages somehow to become one of the strongest stories of the run and – not coincidentally – offers Romana some of her better scenes, putting her learning to use in a practical application. But as the run continued, despite delicious scenes of her bamboozling bandits with her sheer force of personality, and showing her bookish naivety when dealing with Vivian Fay (or Cessair of Diplos as she was more widely known in criminal circles), the strengths of Romana and of Mary Tamm were eroded more and more by the need for the companion in Doctor Who at the time to be the one who did the screaming and the question-asking and the getting captured. The Androids of Tara allowed Tamm a chance to do double-duty as Romana and the Lady Strella, but is essentially little more than a Prisoner of Zenda remake, and by the time of the six episode runaround that was The Armageddon Factor, the First Romana was being captured and threatened and tortured like so many companions in Doctor Who history, and crucially, without much in the way of differentiation. The First Romana was a great idea in concept – someone who could stand up to the Doctor as an equal – and Tamm was more than ready to play the role for all it was worth, displaying both learning and the misplaced certainties of the academic at the beginning of the run, and evolving the role as far as she was allowed during the six stories, blending the benefits of her experience with the understanding of her book-learning, and even developing a certain degree of on-the-hoof chutzpah and that least likely of Time Lord attributes, a sense of humour. What hampered the First Romana on screen was the 1970s, and writers with a keen understanding of those times and the narrative structure of Doctor who within them. If you had a companion who was equal to the Doctor, what you had was effectively two leads and no-one to do the screaming – something that is more acceptable in the 21st century, post-Rose era, but which in the 70s was more difficult for (if anything) the adult audience of Doctor Who to stomach. Tamm, feeling the role hadn’t panned out the way she had hoped (and indeed been promised), gave notice that she wouldn’t do a second season, and with the unique ability gifted to the series by Time Lord characters, a new Romana was recruited – Lalla Ward being recommended by Tamm herself during filming on The Armageddon Factor. Just as Jo Grant softened the imperious intellect of Liz Shaw, so Ward would go on to soften the ice queen allure of Tamm’s incarnation to make it more appealing to the 70s audience. Thankfully, Tamm and Baker were reunited for a solid handful of stories on Big Finish audio before her sad and untimely death at the age of just 62. The range of the First Romana is expanded noticeably across those stories, though intriguingly there’s still a degree to which the 70s dynamic of the Doctor and the companion holds the scope of the First Romana prisoner. While Ferril’s Folly is an irresistible peak into an ‘unseen’ Key To Time story, and the Cuthbert/Laan/Dalek sequence shows Romana being far more in control of events than the on screen version ever allowed, it’s stories that place the First Romana in a classy period setting that best allow the Tamm incarnation to shine – stories like The Stealers From Saiph, The Justice of Jalxar and (for all its inconsequential knockabout romping) The Auntie Matter show the First Romana to her best advantage – playing with the class of the period, allowing the ice queen room to breathe, showing the depth of her intuitive intellect, and the wisdom of experience she has gained from her time in the Tardis before making her decision to stay with the Doctor for a little while longer than her Key to Time mission demands and regenerating into something ‘a little more comfortable’ for the particular Doctor with whom she finds herself matched. 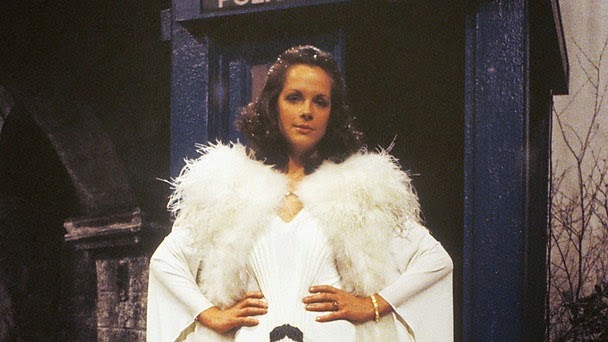 Mary Tamm created an exciting prospect in the role of the First Romana – someone who could determinedly challenge the Doctor’s position as ‘cleverest life form in the room.’ She was both sadly and brilliantly ahead of her time, laying a template of equality that would come to define the relationship between the Doctor and his companions in the 21st century iteration of the show.